The experience of childhood cancer is a complex tapestry of different emotions, ranging from helplessness to inspiration. It’s within this kind of challenge life hands us opportunities and gifts in a place we would never choose to be. In the darkest of nights we find the brightest stars, and that’s just what I found in our experience with childhood cancer. Encouragement, support and inspiration coming from others who’ve turned pain into purpose. Over time I’d like to share some of these inspiring stories of people who shine brightly while creating change. This is a story of one of those stars, or perhaps rather a constellation of stars, making the lives of those suffering a little brighter, sharing magic, hope and love through a special little night light called “Super Max the Turtle.” This special little night light, created by Cloud b, is designed to be easily sanitised it can be taken into all hospital environments to help bring peaceful and healing sleep to children in treatment. They say it takes a village to raise a child. Well this project is certainly a community affair, but its beginnings truly lie within the heart of a young boy. Introducing 10 year old Bryce, innovative, inspiring, kind and wise beyond his years, he is the spark that lit this flame. 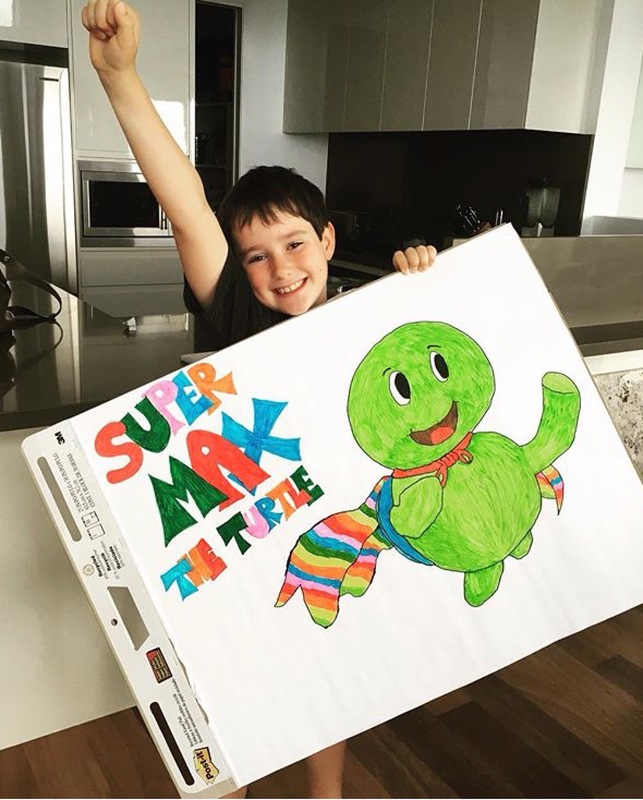 Supported by his older sister, the face behind the happy Super Max the Turtle that visits children in hospitals is none other than 14 year old Mariel, filled with kindness, humility and grace she is Bryce’s number one supporter. The incredible mother is Amy, who in spite of having her own experience with cancer, gives 100% to this special project, a ray of sunshine on the darkest day, a truly selfless human being, creating ribbons of positive change where ever she goes. The man behind the scenes, the stepdad in this family team is the amazing George, passionate and committed about creating positive change in the world, his support in this project comes in so many different forms. Then there’s an army of family and friends ranging in age who help, including the St. Andrews Lutheran College community and so many others from the Gold Coast and around the world, inspired by Bryce to make positive change they support the numerous fundraisers, make donations and offer helping hands whenever needed. Original beginnings lay in the hopes of a 9 year old boy to help ease another child’s fears, a little girl from Greece who was suffering from cancer, Bryce’s passion and enthusiasm quickly infected those around him and soon a family, a school and a community were infectiously involved in spreading hope, love, happiness and comfort to children all around Australia diagnosed with cancer. The project began in August 2016 with Bryce’s initial goal of raising enough money to gift six turtle night lights. 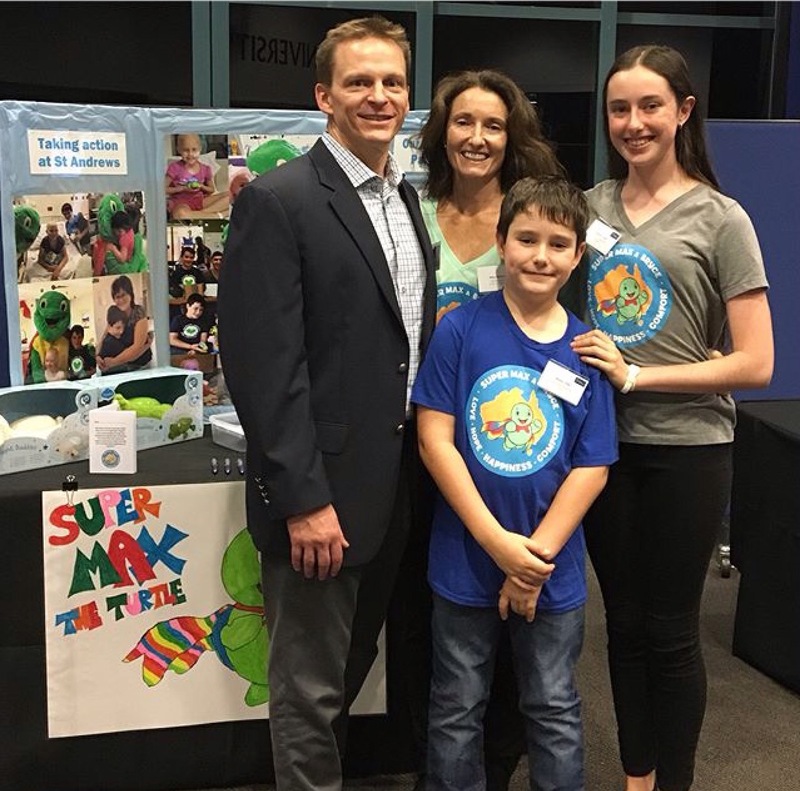 By the end of that year, with the incredible support of his community and the team at Cloud b, Bryce raised enough money to give 244 turtle night lights to children with cancer. Encouraged and inspired to continue to do more, Bryce’s 2017 goal was to give a Super Max the Turtle night light to every Australian child who was diagnosed with cancer this year. 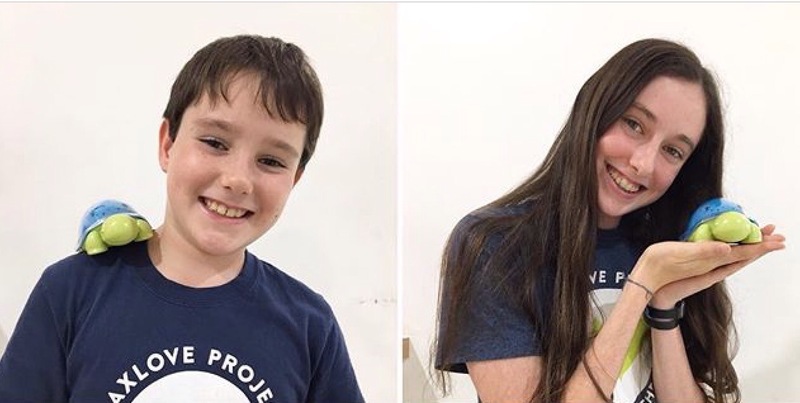 After numerous fundraising efforts from cupcake sales to public presentations enough funds were raised to reach his goal. With ongoing international support from Cloud b and the MaxLove Project, and domestic support from researchers at the Australia and New Zealand Children’s Haematology and Oncology Group (ANZCHOG), as well as the behind the scenes team of wrappers, card writers and packers, this inspiring team was ready to deliver. 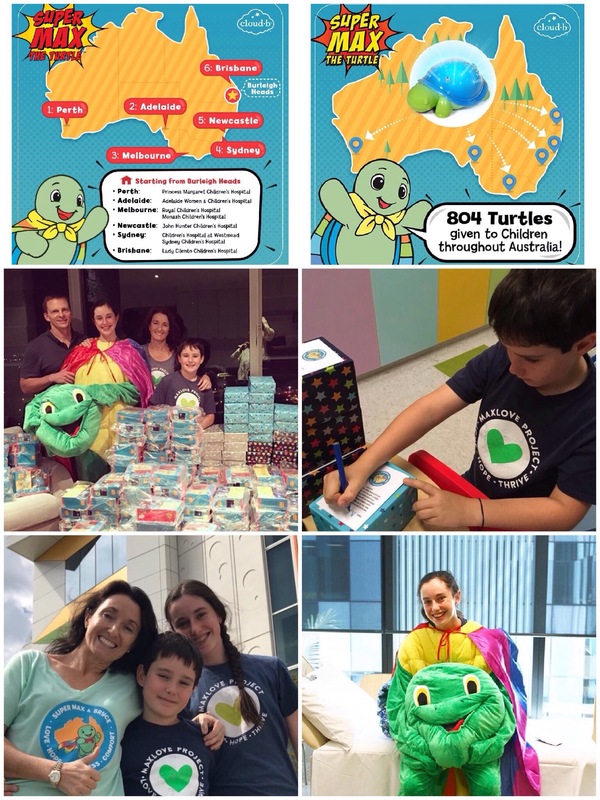 During September this year, Bryce, along with some of his committed team including his sister, Mariel, and mother, Amy, set off around Australia to make their special deliveries. In just under two weeks, they travelled to all eight of the Australian children’s oncology hospitals, visiting Perth, Adelaide, Melbourne, Newcastle, Sydney and Brisbane delivering special messages along with these magical night lights. This year they not only delivered 804 of these magical night lights, but also delivered some special gifts, comfy socks and beautiful scarves generously donated by the team at Annabel Trends, to the supermums, superdads and supercarers. You can be part of the change, make a donation to support this project, not only will you be gifting a super hero fighting cancer with a magical night light you will be supporting childhood cancer research through the team of children’s haematology and oncology specialists at ANZCHOG. P.S. Keep an eye on this incredible team, they’ve got big things planned for 2018, there is going to be a lot more magical stars shining in the children’s oncology hospitals both in Australia and New Zealand. Posted on October 20, 2017 October 20, 2017 by blackbirdbymichellePosted in Childhood Cancer Awareness, lifeTagged Awareness, bethechange, childhoodcancer, family, fundraising, inspiration, light, Story. Previous Previous post: Be The Change – Walking his Talk !